Olathe East took an 18-0 halftime lead en route to a 31-13 win over Leavenworth. Hawks quarterback Connor Leach completed 6 of 10 passes for 83 yards and two touchdowns. Jordan Brown rushed for 97 yards on 16 carries. Leavenworth’s Jason Randall ran for 170 yards and a touchdown on 29 carries. Garden City quarterback Greyson Tempel combined for 309 yards of total offense, and the Buffaloes defeated Wichita East 35-7. Tempel completed 7 of 15 passes for 149 yards and three touchdowns, while rushing for 160 yards and a touchdown. The Buffaloes recovered three fumbles In the win. Wichita Southeast won its second game in a row, defeating Wichita South 27-8. Tre Griffin led the Buffaloes’ rushing attack with 187 yards and three touchdowns on 31 carries. Griffin has rushed for 180 yards or more in each of the past three games. Karl Paige and Keshaun McGaugh ran for one touchdown each. Washburn Rural improved to 5-1 with a 35-14 over Topeka Seaman. Senior quarterback Blake Peterson completed 8 of 11 passes for 170 yards and two touchdowns. Both TD passes went to Washburn Rural’s Tanner Swope. Michael Singer led the Junior Blues with 153 yards and two touchdowns on 17 carries. Peterson also caught an 8-yard TD pass from Singer. Salina Central fell behind 6-0, but then rattled off the next 30 points in a 30-6 win against Andover Central. Malik Veal ran for 174 yards and two touchdowns on 20 carries. As a team, Salina Central ran for 337 yards and four touchdowns. Tanner Robl led the Mustangs defense with 19 tackles. Blake Meier passed for 243 yards and a touchdown for Andover Central. Usually pass happy Lansing used a balanced attack to defeat Bishop Ward 35-20. The Lions passed for 148 yards and two touchdowns, while rushing for 192 yards and two touchdowns. Colin McQuillan led Lansing in rushing with 80 yards and both TDs. Bishop Ward’s Bryan Barnhart ran for 104 yards and two touchdowns. Kansas City Washington earned its fourth consecutive victory, edging KC Wyandotte 36-35. Javeon Williams rushed for 198 yards and two touchdowns on 34 carries to lead the Wildcats. Williams has now rushed for more than 850 yards this season. Dimonic McKinzy led Wyandotte by passing for 369 yards and three scores. He connected with Jeffrice Wilson five times for 171 yards and a touchdown, and Steven Ford six times for 99 yards and two scores. Pittsburg junior running back Alex Barnes rushed for more than 300 yards and five touchdowns as the Purple Dragons ran over Coffeyville 42-14 in a game that was broadcast statewide on Kansas Cox 22. The victory improved the Dragons to 6-0, and they captured the Southeast Kansas championship. Mulvane took a 21-17 halftime lead over McPherson by virtue of last-second Hail Mary touchdown pass from R. J. Reiger to Ethan Evans, but the Bullpups scored the first 21 points of the second half en route to a 51-28 win. McPherson rushed for 465 yards on the night thanks to big performances from T.J. Stites and quarterback Kyler Kinnamon. Stites rushed for 231 yards and two touchdowns and Kinnamon added 225 yards and three touchdowns on the ground on just 12 attempts. Michael Mason led Mulvane with 230 yards on the ground and three scores. Cole Holloway rushed for 145 yards and two scores as Tonganoxie out-paced KC Turner 43-22. The Chieftains led 43-6 until two fourth-quarter touchdown passes by Turner’s Paul Berry. Berry threw for three scores on the night. Tonganoxie quarterback Tyler Ford passed for 160 yards and two scores and added 97 yards on the ground with a touchdown. Cheney outscored Chaparral 21-0 in the second half to claim a 40-21 win. Cardinal back Tyler Amsink scored four touchdowns on the night and threw a touchdown pass to Tyler Trego. Amsink scored all of Cheney’s 21 second-half points on touchdown runs totaling 96 yards. Smoky Valley doubled-up Lyons 56-28 behind a big performance from Matt Guerrero. The senior back rushed for 222 yards and scored five touchdowns as the Vikings wrapped up the Central Kansas League North Division title. 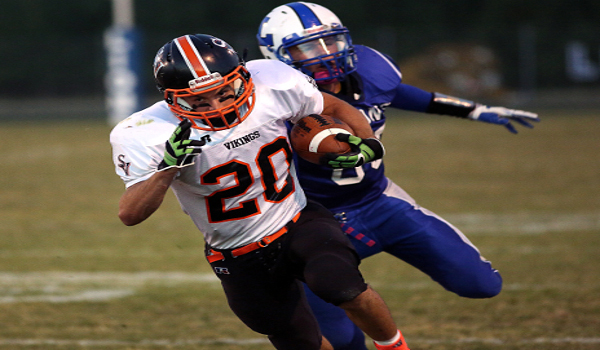 Smoky Valley outscored the Lions 35-0 in the second and third quarters combined to pull away. Brandon Eddy rushed for 185 yards and three touchdowns as Perry-Lecompton beat Royal Valley 28-16. The Kaws extended a 14-8 halftime lead out to 20 points in the third quarter thanks to an Eddy touchdown run and a short touchdown pass from Mitchell Bond to Quinten Sledd. After suffering its first loss a week earlier, Galena bounced back with a 27-15 victory over Girard. Bulldogs junior Logan Johnson ran for 137 yards and a touchdown on 12 carries. Freshman Drake Mittag added 105 yards and a touchdown on seven carries. Taylor Lewis and Trey Eaton each rushed for more than 80 yards for the Trojans. Sacred Heart earned its third shutout of the season with a 61-0 victory over Russell. The Knights ran for 294 yards, while limiting Russell to 99 yards of total offense. Sacred Heart’s Justin McCartney ran for 93 yards and two touchdowns. The Knights get a test in Week 7 from Southeast of Saline (5-1). Defending state champion Scott City got behind 7-0 but fought back for a 28-14 win against Goodland. Paco Bando led the Beavers with 104 yards and a touchdown on 18 carries. Goodland quarterback Trey Teeter threw for 105 yards and a touchdown, but had three interceptions. Maur Hill-Mount Academy picked up its first win of the season with a dramatic 24-22 win over Horton. Brian Scott sealed the win with an interception in the end zone with just over 1:30 remaining in the game. It was a key play for the Junior Ravens who had already squandered a late lead in a 30-26 loss to Oskaloosa earlier this season. Kicker Rafael Riquelme booted a school-record 54-yard field goal as the first half expired giving MH-MA a 17-6 lead. Austin Greenes rushed for a pair of touchdowns for Maur Hill in the game. Ellis slipped by Leoti-Wichita County 13-6 to open 2-1A, District 7 on the right foot. Junior Sean Lee rushed for 161 yards and a touchdown to lead the Railroaders. Eli Lohrmeyer also added a touchdown run for Ellis. Leoti was led by Jantz Budde who rushed for 100 yards and a score. Oskaloosa scored 30 points in the second quarter to get past Leavenworth-Immaculata 60-28. Justin Sharp rushed for nearly 200 yards and three touchdowns to lead the Bears. Luis Rodriguez and Bryce Stottlemire added 104 yards and 69 yards, respectively and each scored two touchdowns. Drew Sachen led the Raiders with 157 yards passing, 154 yards rushing, and two touchdowns each through the air and on the ground. Jeremy Amerin rushed for 270 yards and two touchdowns as Stanton County beat Sublette 22-6 in District 8. The win snapped a three-game losing streak for the Trojans and kept the Larks winless on the season. Sublette hosts winless Syracuse in Week 7. Toby Smith rushed for a touchdown and caught a touchdown pass in the first quarter as Olpe jumped out to a 14-0 lead en route to a 27-6 district win over Oswego. Quarterback Bo Krueger added a pair of short touchdown runs for the Eagles. Oswego scored on a touchdown reception by Brant Yeoman. It appeared that Little River would run away with their district match-up on the road at Lincoln building a 28-8 halftime lead and extending the lead to 36-14 early in the fourth, but the Leopards would mount a furious comeback in the final 5:00 minutes. Sophomore quarterback Zac Walter scored from 3 yards out with 4:35 left, and after a Sam Suelter fumble recovery, Walter hit Jerod Obermueller with a 34 yard strike to pull the Leopards within eight points with 2:49 to go. A holding penalty on the Redskins' next drive put them in fourth-and-forever and a long pass was batted down by Lincoln's Christopher Hester. A personal foul penalty would give Lincoln the ball at the Little River 15-yard line with less than 2:00 minutes in the game. Two plays later Walter would hit Obermueller for a 7-yard score, but the Redskins would stop Walter just short of the end zone on the two-point keeping the score 36-34 with 33 seconds left. Little River recovered the onside kick and kneeled out the clock to escape with the 2-point district win. Hoxie built a 28-12 halftime lead and added two fourth-quarter scores to hold off Ness City, 44-26. Chase Kennedy rushed for 127 yards and four touchdowns to lead the Indians. Junior Connor Katt added 115 yards on the ground on 24 carries. Ness City was led by quarterback Tanner McMillan who threw for 146 yards and a score. Pedro Flores and Jacob Hoss each returned kickoffs for touchdowns for the Eagles. Solomon outscored Canton-Galva 94-60 in a wild eight-man district game where both teams struggled to stop the other. In the end, the Gorillas rushing attack was too much for Canton-Galva. Mason Demars rushed for 227 yards and four touchdowns and quarterback Colton Shirack added 143 yards on the ground and six scores. Shirack also passed for 82 yards and two scores. Solomon led 58-36 at halftime and 72-52 at the end of the third quarter before outscoring the Eagles 22-8 in the fourth quarter. Peabody-Burns scored 24 points in the first quarter and rolled to a 54-8 win over Hartford. Junior Braxton Kyle rushed for 203 yards and four touchdowns to lead the Warriors. Fred Winsor added 158 yards and two scores for Peabody-Burns. Hartford’s lone score came on a Mason Esch touchdown run. Triplains-Brewster outscored Golden Plains 14-0 in the fourth quarter to put away a 48-22 win. Titan’s sophomore quarterback Ryan Gfeller passed for 103 yards and three touchdowns; two going to Nathan Jorgensen and the other to Justin Culwell. Gfeller also rushed for 99 yards and a score, while Jace Jorgensen added 93 yards and a touchdown on the ground. Golden Plains was led by Tristan Schwarz who rushed for 119 yards and three touchdowns. Waverly defeated Class 3A Fredonia 18-0 on Friday night in an 11-man game. Austin Bailey ad Tre Tyson scored touchdowns for the Bulldogs in the first half, and the Bulldogs added a safety in the second half for the win. The two schools had originally scheduled other opponents which fell through and added this game to fill the open date. Fredonia’s initial opponent, Sunrise Christian Academy, only fielded an eight-man team this season, while Waverly’s scheduled district opponent, Altoona-Midway, is only playing a junior varsity schedule. Chetopa scored 32 points in each of the first two quarters as the Green Hornets quickly dispatched of Southern Coffey County, 64-14. Junior quarterback Philip Moses passed for 253 yards and three touchdowns; all to Austen Sanders. Sanders hauled in six catches for 212 yards and those three scores. Derrick Cassell rushed seven times for 103 yards and four touchdowns for Chetopa. Stafford outscored Argonia-Attica 18-6 in the second half to win 46-30. The Trojans led the Titans 28-24 in an entertaining first half. Stafford was led by junior Ethan Johnson who rushed for 265 yards and two touchdowns on 31 attempts. Tristin Paulsen added 132 yards and three scores for the Trojans. A&A was led by sophomore quarterback Alec McDaniel who passed for 306 yards and three scores. Devon Newberry caught seven passes for 141 yards and two scores. The Titans could only manage 28 rushing yards on 23 attempts.